Touch Bionics of Livingston, Scotland and Hillard, Ohio USA won the Stevie Award for Most Innovative Company of the Year in Europe in The 2010 International Business Awards. Here we review the amazing accomplishments of this company’s bionic solutions. continued to expand its innovative product lines since then. 40,000 in the U.S. and 1.2 million worldwide and, before ProDigits, such people had no commercially available powered prosthetic solution open to them. - A new aluminum mechanical structure, for increased overall robustness. ProDigits and the i-LIMB Pulse were the two most significant innovations from Touch Bionics in 2009-2010, but the company continues to be an innovator. In June 2011, Touch Bionics appointed a new Chief Executive Officer, Ian Stevens. With his background at medical devices companies Mpathy Medical and Optos, he will be leading the company through its next phase of growth. “I am very pleased to be joining Touch Bionics at such an important point in the company’s evolution and I am looking forward to working with the team at Touch Bionics to ensure that the company enjoys continued success,” said Stewart. Ian Stevens joined Touch Bionics from medical devices company, Mpathy Medical, where he had served as CEO since November 2007. Prior to that, Stevens worked for Optos, a medical technology company specializing in devices that image the retina, from 1999-2007. At Optos, he served as General Manager for North America, where he had responsibility for all operations in the United States and Canada. Stevens also served as Chief Financial Officer and Director of Operations during his time at Optos. Touch Bionics is a developer of advanced upper limb prosthetics designed to bring a greater return to form and function for amputees and people with congenitally missing limbs. Touch Bionics created the i-LIMB Hand, the world's first powered prosthetic hand with five articulating fingers, and was the first company to offer a powered prosthetic solution for patients with missing fingers, ProDigits. In addition to its powered prosthetic hand and partial-hand products, Touch Bionics offers a range of custom aesthetic restoration solutions through its LIVINGSKIN business, which are passive prosthetic devices designed to match exactly to a person's natural skin tone. 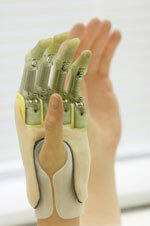 For more information, visit www.touchbionics.com.